President Barack Obama will seek $500m (£350m) in new funding and deploy up to 1,200 extra troops to help secure the US-Mexico border, US officials say. National Guard troops would be deployed until the US can recruit and train additional agents to serve there, an administration official said. 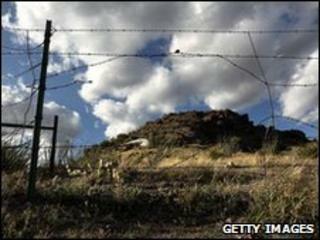 The move follows pressure from US border states for action to help curb illegal immigration and drug violence. Mexico urged the US to use the troops to pursue criminals, not migrants. "Mexico is confident that the National Guard personnel will enhance efforts to combat transnational organised crime which operates on both sides of the border and... not conduct activities directly related to the implementation of immigration laws," the foreign ministry said in a statement quoted by AFP news agency. Last week, Mexican President Felipe Calderon urged Congress to reform US immigration policy, and criticised a new Arizona law which requires police officers to check the immigration status of people they have stopped while enforcing other laws, if they suspect the individuals are in the country illegally. He also asked US lawmakers to halt the flow of arms over the border into Mexico, in a bid to stem his country's bloody drug war. Addressing Congress, Mr Calderon said he was confident his country would defeat drug gangs with American help. The extra border troops will provide intelligence, surveillance and reconnaissance support for existing law enforcement officials, as well as help with counter-narcotics and training, administration officials say. President Obama has already condemned the controversial new law in Arizona aimed at picking up illegal immigrants from Mexico, but he is now acting to calm the fears that lie behind it. The administration is careful not to suggest this is a panic reaction to failure. They say their approach is already working, and boast of seizing a record number of illegal weapons and achieving a lower than average crime rate along the border. The political problem is that while the move to bolster the border may well not appease critics on the right, it does little or nothing to silence worries from the president's own party. Although there is a routine promise to reform what is referred to as the 'broken immigration system', many Democrats - particularly from the Latino community - will still be dismayed that there are not firm plans and no dates attached. The extra funds will be used to increase the numbers of federal officers working on the border as part of what one official described as a multi-layered effort to target illicit networks trafficking people, drugs, illegal weapons and money. Gabrielle Giffords, a Democratic congresswoman from Arizona, said the White House was doing "the right thing". "Washington has heard the message of Arizonans, that more boots on the ground means a safer and more secure border," she said. Mr Obama has made immigration reform one of his priorities, but analysts say legislation is unlikely to make it to Congress in a year when all the seats in the House of Representatives and a third of those in the Senate are up for election. Recent opinion polls suggest the Arizona law has wide backing there, but it has caused outrage in Mexico, whose citizens make up three-quarters of the estimated 12 million illegal immigrants living in the US. In his address to Congress last week, Mr Calderon asked for help in stopping the flow of weapons across the border into Mexico, saying that 80% of recently seized guns could be traced to the US. More than 22,000 people have been killed in Mexico since Mr Calderon came to power, most of them in drug-related gun battles. Mr Calderon has deployed 50,000 soldiers to help quell the violence, but so far with limited success. Under the Merida initiative, the US promised Mexico and other Central American countries $1.3bn (£910m) to help train and equip their security forces. But US State Department figures show less than 10% of that amount has actually been delivered to Mexico.